This chapter will focus on theoretical, clinical and personal challenges surrounding my work as an art therapist in an adult outpatient service of a psychiatric hospital. The evolution of my thinking pervades my clinical work with the client discussed in the vignette, as I sought to integrate desublimation from art theory and philosophy with psychoanalytic theory. (Thompson, 2007). When I first met Evelyn, who is diagnosed with Schizoaffective Disorder, she was hospitalized, constantly agitated and psychotic with auditory hallucinations, severe labile mood, disorganization in cognition and behavior and paranoid delusions, linked to her experience of the polarizing states of grandiosity and inferiority. She constantly sought to expel the experience of being belittled and hurt by projections and hostile attacks on other patients and clinicians. As a result, she was frequently expelled from verbal group psychotherapy after vicious angry attacks on peers and therapists. She could frequently be seen pacing the hospital corridors while engaged in an angry verbal monologue of diatribes. Evelyn’s physical appearance was also notable for her reliance on trailing scarves, jewelry, and numerous bags and necklaces, strung impossibly around her body. Staff and fellow patients at the center would consciously avoid her when she approached, anticipating the inevitable hostile barrage of affect, fueled by paranoid ideation. Geoffrey Thompson, MFA, MA, ATR-BC, LCAT is creative art therapist and works at Maimonides Medical Center in NYC, in acute inpatient and outpatient psychiatry. He is a professional artist who regularly exhibits his work. He has given numerous lectures and presentations, and his paper on Artistic Sensibility was recently published. In addition Geoff founded Gallery 1236 at Maimonides and serves on the editorial board of Art Therapy: The Journal of the American Art Therapy Association. 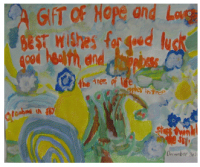 He is the chair of the American Art Therapy Association’s Art Committee.